How to select thermal binoculars? Read on to learn how to purchase the best ones for your needs. Whether it is for the military or hunting at night, the possibility of failure and accident increases if you can’t see what’s around you. Thermal binoculars help you distinguish any targets warmer than absolute zero (-273°C/-459°F). Thermal imaging technology focuses and detects the radiation and translates the temperature into images to offer you the heat map around you. The technology save lives on the combat field and keep you safe and decrease the chances in hunting field that you’ll go home empty handed. Even if you have night vision equipment, you may also consider upgrading your device to thermal imaging. Here are the main things to look for when selecting thermal binoculars. Noise Equivalent Temperature Difference measures how well a thermal detector distinguishes small differences in thermal radiation. The NETD is a small number measured in milli-kelvins. When the noise equals the smallest measurable temperature difference, the detector reaches the limit of its ability to resolve a useful thermal signal. A higher NETD value means that there is more noise. Small differences in this measurement make a big difference. There’s a noticeable difference between 40 mK and 80 mK. The higher the number, the better the thermal binocular is. You probably know that detector resolution is important, but do you know why? The resolution determines how many pixels your binoculars use to create a thermal image. You can tell how many pixels binoculars read by looking at the detector resolution. For example, a low-end pair of binoculars might have a detector resolution of 160×120. These binoculars process 19,200 pixels. A high-end pair has a resolution of 320×240 640*480 or even higher. There is a huge difference in picture quality between these two binoculars. The higher-end pair provides four times the data for thermal detection. Unfortunately, there’s also a big difference in prices. The detector resolution also determines how far away you can view something using the binoculars. The higher the number, the more accurate the image is from a distance. This is particularly important for night hunters and military customers. Most thermal devices come with either 9hz and 30hz. The higher this number the better. Low frame rates produce low-quality images that appear blurry when objects move. If you plan on using your thermal binoculars on moving targets, you’ll need a higher frame rate. As a military grade thermal binoculars, the frame rate comes to 50hz in most cases. The diameter of the objective lenses determines how much light the binoculars gather and how far the detection range goes to. When using thermal binoculars, you’ll need objective lenses with a larger diameter to capture more light and detect further. This provides you with a clear picture of your targeted viewing area. In order to detect man as far as 2000m, you may need a lens as large as 50mm. A lot of new buyers don’t take weight into consideration when buying thermal binoculars. If it is a military grade binoculars, however, a super light weight equipment is one of the must-have features to be carried for all-weather operations. On the other hand, if you’re using your binoculars for hunting. You’ll hold them up to your face for long periods at a time. Combined with the pressure of carrying your gear, the amount of time you’ll use your binoculars will tire your arms out. You don’t want to spend the day after your hunting trip recovering from sore muscles, do you? 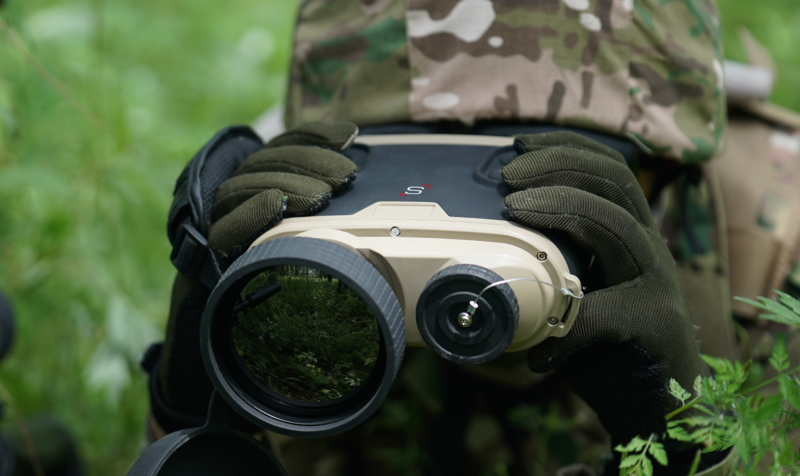 The average pair of thermal binoculars is around two pounds. That doesn’t seem like much, but when you’re using them frequently, they wear your muscles down. Look for lightweight options that you can carry with you anywhere. When you’re hunting and carrying around equipment, mistakes happen. When you’re hunting at night, it increases the chances that you could drop your binoculars. The code for protection level starts with the initials “IP", which stands for international protection or ingress protection. Following IP, there are two numbers that rank the binoculars in different protection categories. The first number represents solid protection. This rating tells you the level of protection the encasing of your binoculars provides against hazardous parts and foreign objects. 1 – Provides protection against an object size >50mm. Protects against accidental striking against a body part such as your hand or leg, but not against deliberate contact. 2 – Object size >12.5mm. Protection against intrusion by fingers or objects of similar size. 4 – >1mm. Protects against small wires, screws, nails, and similarly sized objects. 5 – Protects against dust and contact. Dust can still get into the binoculars and cause some problems, so it’s best to keep them as clean as possible. 6 – Complete protection against contact and allows no ingress of dust. These are the sturdiest thermal binoculars you can buy. 0 – No protection. If water enters your equipment, expect total failure. 1 – Dripping water from above has no harmful effects. Think of a dripping faucet. 2 – Protects the binoculars from vertically dripping water when the device is at a 15? angle. 3 – Protected from water that falls as a spray at any angle up to 60? from above. 4 – Water splashed onto the binoculars from any angle or side doesn’t have any harmful effect. 5 – Protects your device from water sprayed through a nozzle from any side. 6 – Protects your device from a strong spray from any side. Imagine a high-pressure water hose spraying onto your binoculars; they wouldn’t sustain water damage. 7 – Protects your device from water immersion up to 1m. If your binoculars become immersed up to 1m under normal conditions, the ingression of water has no harmful effects. This rating relies on following manufacturer guidelines. For example, some devices say immersion for under 10 minutes. 8 – Protects your device from water immersion and ingression over 1m deep. Also depends on manufacturer guidelines. If your binoculars rate as IP67, they’ll have complete protection against contact and dust and won’t fail due to water immersion up to 1m. Always consider how you’ll use your binoculars when buying them. Whether you’re a night hunter, in the military, or a security officer that wants to keep an eye on your client’s property, we have the equipment you need. We take research, development, and quality control seriously because we know that you rely on our products for your safety. If you are in the market for thermal equipment, check out our products today! Previous Previous post: Night Vision vs. Thermal Imaging: Which is Better?